Devart announced the release of a new version of the professional tool for SQL server data comparison and synchronization – dbForge Data Compare 2.00. Committed to support the needs of database-dealing professionals, Devart now delivers dbForge Data Compare for SQL Server 2.00 that incorporates three times faster data comparison and synchronization, the smallest price and greater satisfaction than all other data comparison tools offer. Incorporating these three components, dbForge Data Compare for SQL Server guarantees greater satisfaction and smother database-dealing experience for any SQL comparison and synchronization goals. 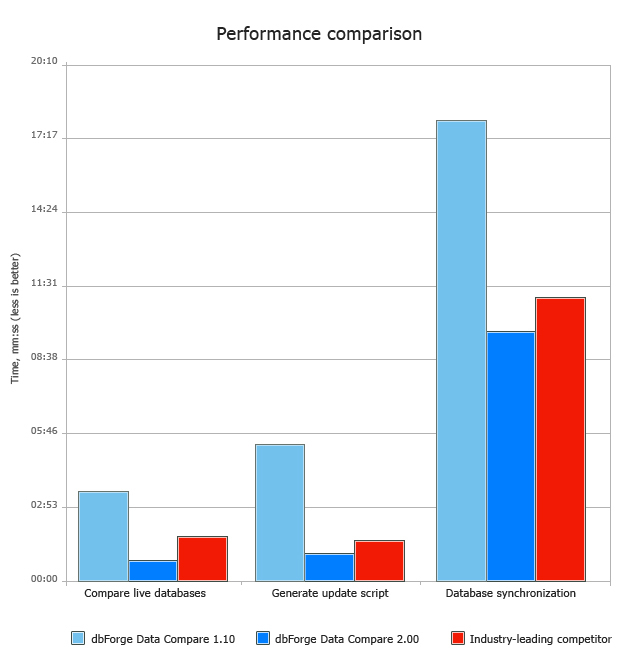 Higher performance in practice Having passed multiple performance tests on large databases including billions of records and extra large BLOB data types, dbForge Data Compare 2.00 proved marked performance improvement as compared with the previous version and beneficial leading among competitors. Now the users will enjoy 3 times faster comparison and 2 times faster synchronization. Support of native SQL Server backups This will allow selecting native SQL Server backups as a metadata source and bringing more freedom while updating data in SQL Server databases. Besides traditional live databases, now any combination of databases and backups is possible to compare. Data comparison and synchronization via command line dbForge Data Compare 2.00 can be used with a Windows task scheduler to compare and synchronize data in automatic mode via command line and check the required result at desired time without permanent supervision. Extended data comparison and synchronization options The users can better tune their comparison and synchronization as dbForge Data Compare 2.00 offers a wider choice of options. Now auto mapping, comparison, and display options are at the disposal. Generating comparison and synchronization reports Now all data differences between compared databases can be saved and transformed into smart and comprehensive reports automatically. This is a beneficial feature that can save precious hours usually spent on data analysis and report preparation. Product editions available dbForge Data Compare leads all other data comparison tools not only in performance but in price. Now two product editions, Standard and Professional, offer a choice of functionality and an opportunity to pay only for necessary things. With dbForge Data Compare 2.00, Devart continues its initiative to produce efficient and database experiences for all the people in SQL Server world. Check the benefits yourself, download dbForge Data Compare for SQL Server now for free. Tell us what you think about the new version at dbForge Data Compare feedback page. We are looking forward to your comments and suggestions. Developer Bundle will take you to 2019 right now!